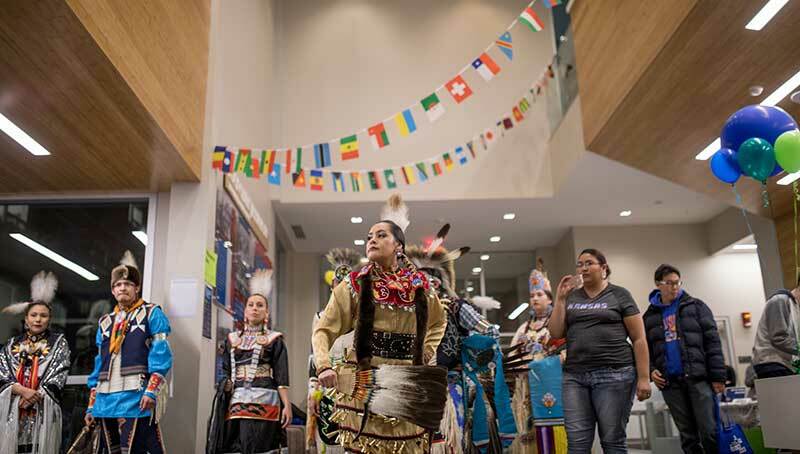 LAWRENCE — Cultural performances and games from around the world will highlight the third annual International Jayhawk Festival, which will be 4-7 p.m. Thursday, Feb. 8, in Daisy Hill Commons. The festival celebrates the global community at KU and the international opportunities on campus and abroad. While the event is geared toward first- and second-year college students, all students are invited to attend. The first 300 students will receive a free festival T-shirt. The festival will feature 30 different campus organizations that represent everything from study abroad and foreign language to student organizations and internationally focused careers. A student art exhibition will feature work created while on or inspired by study abroad. “The International Jayhawk Festival is one of those annual events that truly showcases the breadth and depth of international opportunities for our students across campus. What I am always particularly impressed by is the strength of the collaboration that goes into this event. It is a true celebration of all the wonderful elements our community brings together to create a world-class university like KU,” said Charles Bankart, associate vice provost for International Programs. The growing number of Jayhawks traveling abroad has led to KU ranking in the top 20 in public universities for undergraduate participation in study abroad, according to the 2017 Open Doors Report. The Office of Study Abroad offers programs in every major and $200,000 in scholarships every year. Along with meeting advisers from study abroad programs, students can discuss academic programs within the School of Languages, Literatures & Cultures and area study centers. KU offers courses in more than 40 languages, which is more than any other university in the Big 12 Conference. Students can take courses on the history, politics and cultures connected to those languages. Faculty, academic advisers and staff will be on hand. Dozens of international student organizations will take part in the festival. In addition to information tables, students will perform songs and dances from India and Brazil. The International Peer Support group will host a game room with selections from Ecuador, China and Malaysia, among others. SLLC will have a photo booth for students. Student Union Activities is sponsoring free food for attendees, and Pepsi will provide drinks. This is a universitywide effort. Sponsors include SUA, the Office of Study Abroad, the Global Awareness Program, KU Honors Program, KU Career Center, KU Libraries, CLAS Office of Diversity, Equity & Inclusion, School of Languages, Literatures & Cultures, Ermal Garinger Academic Resource Center, Student Housing, Kansas African Studies Center, Center for Russian, East European & Eurasian Studies, Center for Latin American & Caribbean Studies, Indigenous Studies Program, Center for East Asian Studies, Center for Global & International Studies, Experiential Learning, KU Academic Accelerator Program and the Applied English Center. Photo: The International Jayhawk Festival, 2017. Credit: Meg Kumin, KU Marketing Communications.